What do you get when timeless take-out meets innovative gourmet convenience? Pure dinner magic. Just as quick as take-out only without the fuss of driving to the restaurant, this traditional taste is just as authentically delicious... and ready to eat straight from the freezer in less than 15 minutes! Our exclusive, upscale take on this take-out treat begins with plump, succulent white meat chicken breast - lightly tempura battered and fried for the perfect amount of crisp - alongside generously sized broccoli florets. 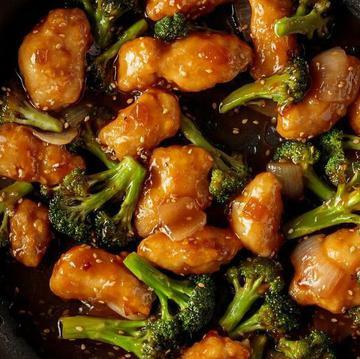 These premium ingredients are smothered in a sesame sauce boasting an impossibly flavorful balance of sweet and salty created from a mix of soy sauce, toasted sesame oil, white vinegar, and brown sugar. All of it lovingly sautéed by you in a single skillet and served on a bed of long grain white rice - included, of course! So the next time your taste buds try to tempt you for take-out, simply walk to your freezer and take out this genuine taste sensation. Do Not Thaw! Keep Frozen Until Ready To Use. Appliances vary, adjust cook time accordingly. Stove Top: Open meal bag and remove the sauce pouch and the rice pouch. Begin thawing sauce pouch in bowl of HOT water while preparing meal. On stove top heat 10-inch NONSTICK skillet over medium-high heat. Add 1 tablespoon oil and remaining bag contents to skillet. Add 2 tablespoons water to skillet, cover and cook for 9 minutes, stirring occasionally. Microwave rice pouch on HIGH for 3 minutes. Add thawed sauce to the skillet and stir to coat ingredients. Cook uncovered for 1-2 minutes or until sauce is hot and bubbling. Carefully remove rice pouch from the microwave, open and pour into serving dish. Pour contents of skillet over rice and serve. Garnish with sesame seeds. Ingredients: COOKED LONG GRAIN WHITE RICE (COOKED LONG GRAIN WHITE RICE, WATER), COOKED TEMPURA CHICKEN (CHICKEN BREAST MEAT, WATER, SALT, SODIUM PHOSPHATE. COATED WITH: WATER, ENRICHED WHEAT FLOUR [WHEAT FLOUR, MALTED BARLEY FLOUR, NIACIN, REDUCED IRON, THIAMINE MONONITRATE, RIBOFLAVIN, FOLIC ACID], CORN STARCH, DEXTRIN, MODIFIED POTATO STARCH, RICE FLOUR, SALT, NONFAT DRY MILK, LEAVENING [SODIUM ACID PYROPHOSPHATE, SODIUM BICARBONATE, MONOCALCIUM PHOSPHATE), EGG WHITES, EGG YOLK POWDER, DEXTROSE, XANTHAN GUM), COOKED IN VEGETABLE OIL. SAUCE (WATER, BROWN SUGAR, MIRIN [CORN SYRUP, WATER, DISTILLED VINEGAR, FERMENTED RICE EXTRACT (RICE, ALCOHOL, SALT, CITRIC ACID), BROWN SUGAR, POTASSIUM SORBATE AND SODIUM BENZOATE (PRESERVATIVE)], SOY SAUCE [WATER, WHEAT, SOYBEANS, SALT], ONION, CANOLA OIL, CHICKEN CONCENTRATE [CHICKEN STOCK, NATURAL FLAVOR, SALT, SUGAR, YEAST EXTRACT, CHICKEN FAT], SESAME OIL, GARLIC [WATER, GARLIC], SESAME SEED, CORN STARCH, GINGER [GINGER, WATER], CHILE SAUCE [RED CHILE PEPPERS, DISTILLED VINEGAR, SALT, XANTHAN GUM], WHITE DISTILLED VINEGAR), BROCCOLI FLORETS, ONIONS.